Our long warm fall has turned into a long (or so it seems) cold winter. Not a lot of rain, snow or cloudy skies, but still very cold. At least for me! After holiday excesses we spent most of last week juicing and drinking smoothies to try and detox a little. After a week of that I was really ready for some bulky, tasty and very hot food. Baked beans seemed like just the thing. Threw a batch together and stuck them in the oven. The thing to remember in this recipe is that you need cooked white beans. You can do them from scratch either in a pressure cooker or by boiling or you can simply used canned. Used canned on these because I didn’t want to wait to soak and then cook them. Just slightly impatient. 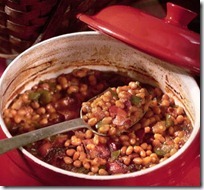 . .
We had the baked beans and a salad for lunch. Can’t tell you how wonderful they tasted! It might have been that I wanted food so badly, but I doubt it. They tasted even better the next day. 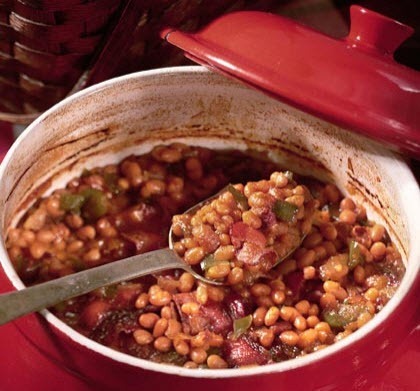 This entry was posted in additive-free food, Beans, entrée, plant based diet, vegan, vegetarian, Whole Food Plant-Based nutrition and tagged Baked beans, Bean, Boston, New England cuisine, vegetarian boston baked beans. Bookmark the permalink.